The alarm clock goes off at 5:30am and I roll out of bed ready to begin what I call the “morning madness”. The morning madness is the battle that I fight Monday through Friday to get the kids up, fed, and out the door on time with as little whining, complaining, fighting, and yelling. When school began last year with two kids now attending, I felt like every school day morning I was running a sprint for 2 hours until they were dropped off at school and I could finally breathe! The battles over clothes, getting ready, eating breakfast, getting their backpacks ready, and getting out the door was something that I would dread Monday through Friday. I set out to find a system that made them accountable and also gave me a little bit of sanity in the mornings! I created a morning checklist for each child of what they needed to do in order to get ready for school and us out the door on time. 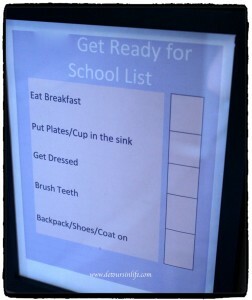 This checklist included: getting dressed, brushing their teeth, eating breakfast, putting their dishes in the sink, and gathering up their backpacks. Each child checks off their steps with a dry erase marker without me needing to remind them constantly! It took a little bit of adjustment for them, but it has worked great for us so far. I created the checklist in Excel and I used some cheap frames that I found at Hobby Lobby. Once you put the paper behind the glass, it becomes an instant dry erase board for the kids to check off. This year I added a new component to the system. 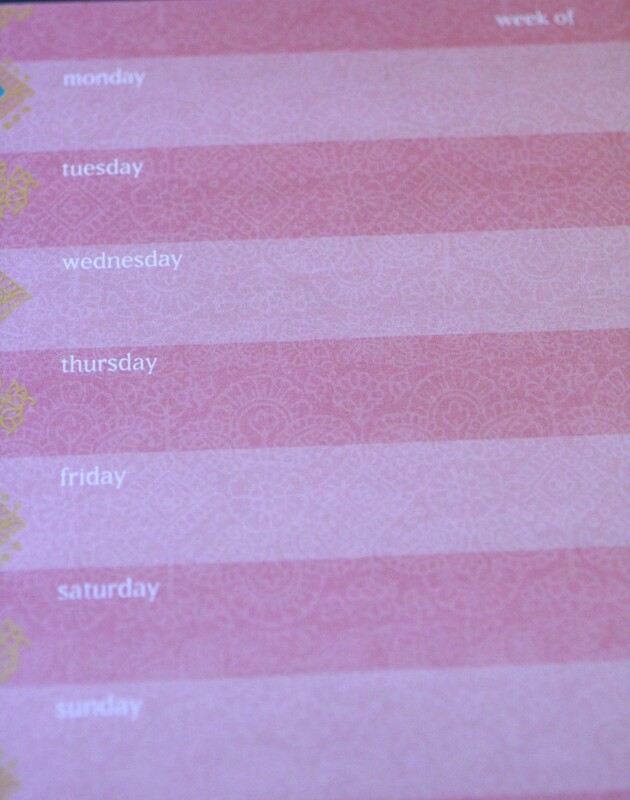 I found some sheets from Post It that have the days of the week on them. For each child, I write their Encore schedule (Art, Music, PE, Library) on the sheet and I have placed it in their closet so they know when picking out their clothes what they need to be prepared for that day. It has saved me a lot of time and my sanity as well! Another tip that I found extremely helpful was to immediately go through their backpacks when I got home and to sign anything I needed to sign, remove papers that needed to stay home, and get my daughter’s snack in the backpack for the next day. That eliminates having to worry about it in the morning! What are some of your ways to eliminate the morning madness?